Emily Bronte was born on July 30th 1818 at Thornton, Bradford in Yorkshire, fifth child of the six children. Her mother died of cancer in 1821. In 1824 she attended the newly opened Clergy Daughters' School at Cowan Bridge. While there along with her sisters Maria, Elizabeth and Charlotte they suffer the harsh regime, cold and poor food. In June 1825 Emily and her sisters were finally taken away from the school for good. In July 1835 she enrolled at Miss Wooler's school at Roe Head Mirfield which lasted for 3 months, returning to Haworth in October. In February 1842 Charlotte and Emily left Haworth for the Pensionnat Heger at Brussels. While there they learnt French, German and Music. In November 1842 Emily returns to Haworth with Charlotte. In September 1845 Charlotte inadvertently discovers Emily's poems. Emily is angered by the intrusion into her private writings. Her sister convinced her to collaborate on a book of poems. About this time it is thought Emily started to write Wuthering Heights. In May 1846 under the Pseudonym of Currer Ellis and Acton Bell, a book of Poems was published, Emily contributed 21 poems. In July 1847, the publishers; Thomas. Cautley. Newby accept Wuthering Heights which is published in the December. In November 1848 Emily's health was poor. 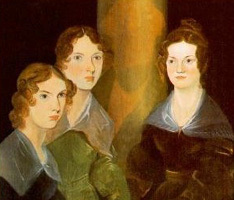 Charlotte Bronte writes that her sister has difficulty in breathing and pains in her chest. On 19 December 1848 Emily Bronte died at 2 o'clock in the afternoon. She was 30 years old. On 22 December she is laid to rest in the family vault in Haworth church. December 1850 new edition of Wuthering Heights is printed with selected poems and a preface written by Charlotte.